Quick access to detailed, easy to understand reports makes it possible to analyze information proactively on a regular basis. And if a report isn’t exactly what you need, create a custom report with just a few clicks of your mouse. 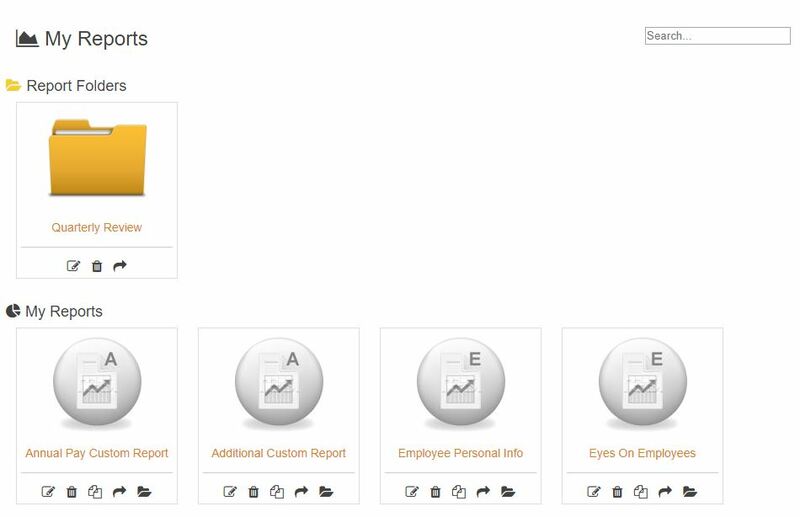 Save and share reports with anyone in your company just as easily and have your custom reports at your fingertips. All this and more is offered in our HR Software. An extensive report library is at your disposal. Terminated section shows employees/workers who have been hired. Breakdown by Department Chart shows a breakdown of your employees/workers by department and by age segments. Benefit Census – Used annually by HR administrators to provide information needed by the Benefits providers. Birthdays Report – Is broken down by month and shows the date of an employee’s birthday, their name and their age in parenthesis. EEO-1 Report – Report that is required to file by some companies based on the amount of employees they have. The report has EEO Job categories listed on the left with Ethnicity & Gender listed at top. Intersecting boxes list the amount of people in each. Last Pay Change – displays the last pay change for each employee/worker. Point in Time – displays a report displaying information from any fields of information you choose from a single date in history. This might help you with understanding compensation levels or specific job information for employees on that specific date. Salary History – displays a filterable list of all salary histories. Time Off Balances – displays a filterable list of the time off balances of all employees with the ability to set a “As Of” date. Time Off Schedule – displays a calendar interface at the top indicating the time off that employee have requested and has been approved along with holidays. It also displays a list report below the Calendar with from and to Dates, Name, Status, Type, Amount and Notes. Time Off Used – displays a filterable list of employees/workers who have taken time off. Turnover Rate – displays organizations turnover rate by month, quarter and by year historically. Displays number of terminated employees/workers, Avg. Employee Count and Turnover rate percentage. Years of Service – displays complete list of employees/workers by month and the number of years they have worked for your organization.